I just had to let you know about an incredible way to help you elevate your business to a new level in 2015. 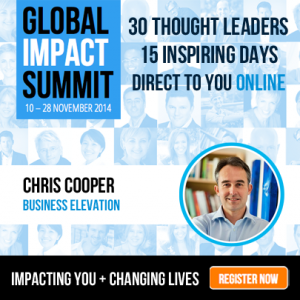 I’ll be speaking as one of the thought leaders for the Global Impact Summit kicking off 10 November 2014 over 15 inspiring days, live and online, delivered to you on mobile, on your laptop or desk. I am speaking at 10.10am on the 25th November. However, if you miss it do not worry – all the shows will be available from an archive so register anyway! Do join me and learn how you can dramatically increase the impact you have in your business and on our world. I will be talking about elevation and a key concept of how to access your power to get things done (whether you feel like it or not). You can click here to register and, as you’ll see, you make an impact the moment you register too. And when you follow the link, you’ll see what an incredible line up of speakers there are. It’s going to be an amazing way to get some superb insights to add to your business AND to make a difference to our world at the same time. Even if you can’t get to every one of the sessions live, register now. They are being recorded so you can watch the replays. It’s a wealth of inspirational business advice for you to keep!